A world-first study assessing the safety of skin-to-skin care for very preterm babies on breathing support has proved the practice is safe and should be encouraged. The study, conducted at the Royal Women’s Hospital and led by paediatrician Dr Laila Lorenz, focused particularly on a newborn’s brain oxygen levels, and other vital signs such as heart rate and temperature, to determine whether babies were stable enough when removed from their incubator and placed on their parents’ chest. Skin-to-skin care (SSC), also known as kangaroo care, involves a newborn, wearing just a nappy, being placed on their mother or father’s bare chest. Dr Lorenz said previous research had shown SSC could have many health benefits for both parents and baby, however it was important to prove it was safe for very premature babies on breathing support. “In developing countries, skin-to-skin care in very preterm babies has been shown to improve weight gain, reduce infection and facilitate an earlier discharge home,” Dr Lorenz said. “It also has great benefits for infant-parent bonding and breastfeeding in term babies. Dr Lorenz said prior to this research, published in the Archives of Disease and Childhood, clinicians and nursing staff were often concerned that SSC could affect the baby’s stability, in particular the oxygen levels of very preterm babies. “For skin-to-skin care to be suitable, the baby needs to be stable from the moment they are moved from the incubator, throughout their contact with their parents, until they are returned to their incubator,” she said. “This study found brain oxygen levels in the baby remained unchanged compared with levels measured whilst they were being nursed in the incubator, which means we now have solid evidence to confidently support the practice with very preterm babies on respiratory support. Dr Lorenz said the research would not only assist clinicians and nursing staff in assessing a baby’s suitability for skin-to-skin care, but give anxious parents peace of mind when holding their newborn. “Having a very preterm baby can be very distressing for parents and understandably, they can be quite nervous to have their baby out of the incubator. We hope this research will help ease their minds and allow them to relax and enjoy this special bonding time,” Dr Lorenz said. The results have already changed practice at the Women’s with the medical and nursing teams recommending skin-to-skin care earlier than before. “Skin-to-skin care was particularly beneficial for mothers to encourage milk production, which may not have begun due to the baby’s early arrival and maternal anxiety caused by the premature birth,” Dr Lorenz added. 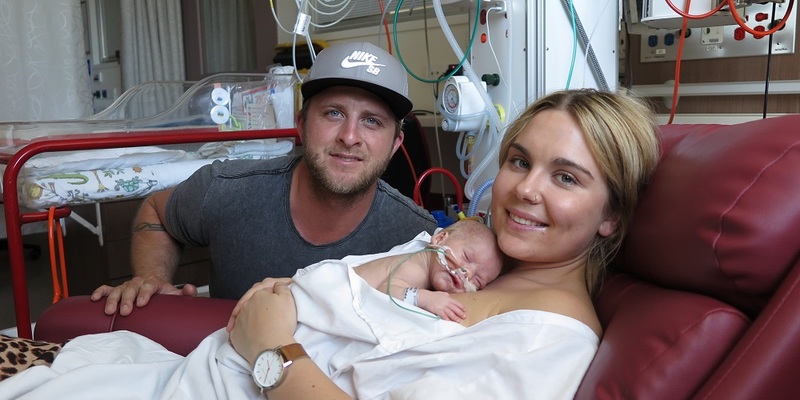 Mother Jessica Holland had an emergency caesarean at 29 weeks after experiencing potentially life threatening pre-eclampsia. “I was scared the first time I held him when he was three days old. I didn’t know if it was good to take him out of his crib or whether it was going to harm him,” she said. “This new research is reassuring.